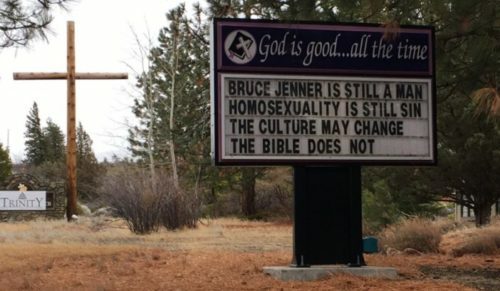 Justin Hoke, the pastor who put up an inflammatory sign decrying gay people and deadnaming Caitlyn Jenner, was forced out of his position in the church. Someone also vandalized the sign, breaking the glass and stealing some of the letters. This past Sunday, Hoke wrote on Facebook that he was pressured to step down. The other elder at the church said that he no longer had confidence in Hoke, and everyone except for one couple in the church said that they would leave if he stayed on as pastor. The other elder agreed to take on the role of pastor and Hoke left. “I would like to add this, I did not want to leave, I did not quit, and I was willing to stay,” Hoke added, to make it clear that he did not quit, but that he was effectively fired. “The response we’re receiving from this sign proves that it was posted way too late,” he wrote in the comments of the original post of the sign. “Even acknowledging that we live in a more rural, and generally a more conservative area — the fact that somebody thought that that would be accepted by our community was definitely surprising,” Amelia Mallory, who organized the rally to support LGBTQ people, told the LA Times.